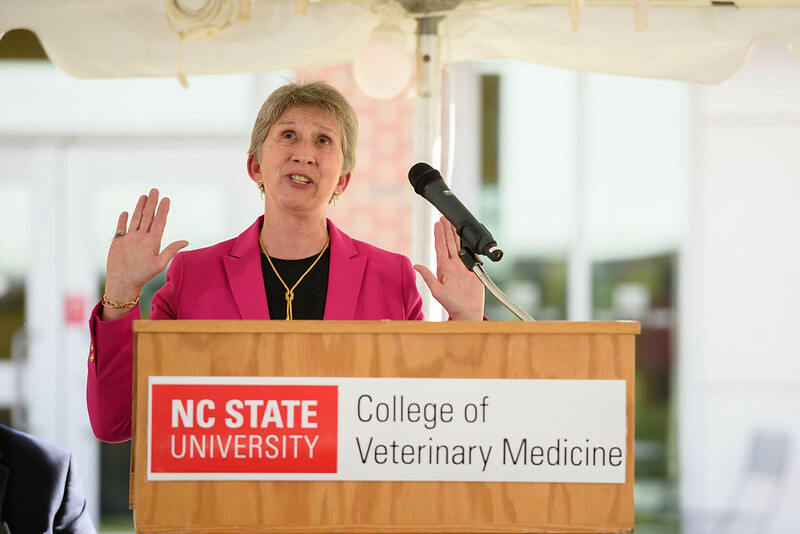 When Natasha Olby finished her veterinary neurology residency at NC State in 1999, she had a big decision to make — what to do next. She interviewed for several jobs, in the U.S. and in England, where she was born and raised and earned three degrees at the University of Cambridge. 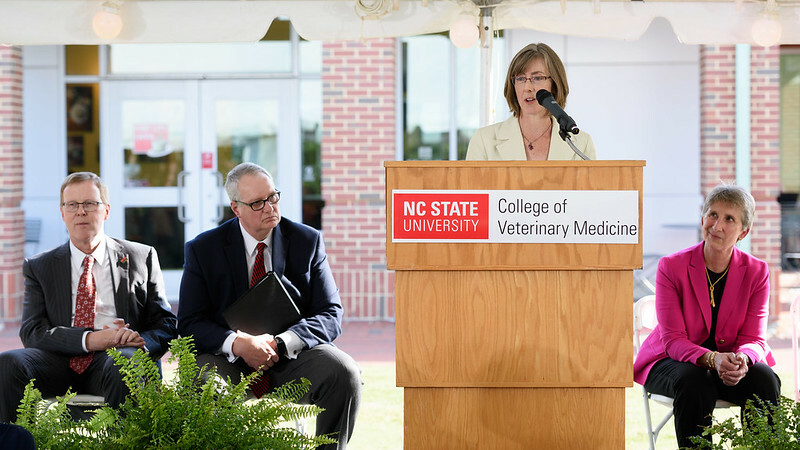 But she decided to stay at the NC State College of Veterinary Medicine. She has been here ever since. After more than 20 years at the CVM, Olby’s work continues to evolve. 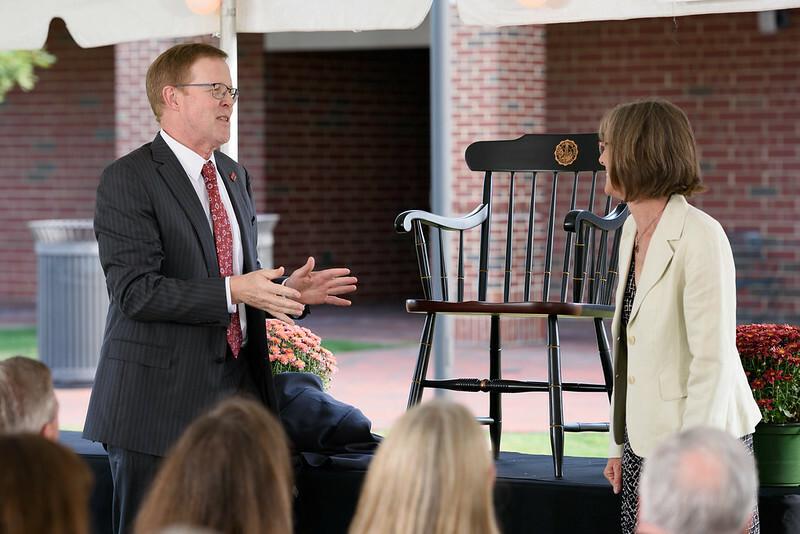 In a ceremony on the college’s hearth on Monday, Olby was presented with the Dr. Kady M. Gjessing and Rahna M. Davidson Distinguished Chair in Gerontology. 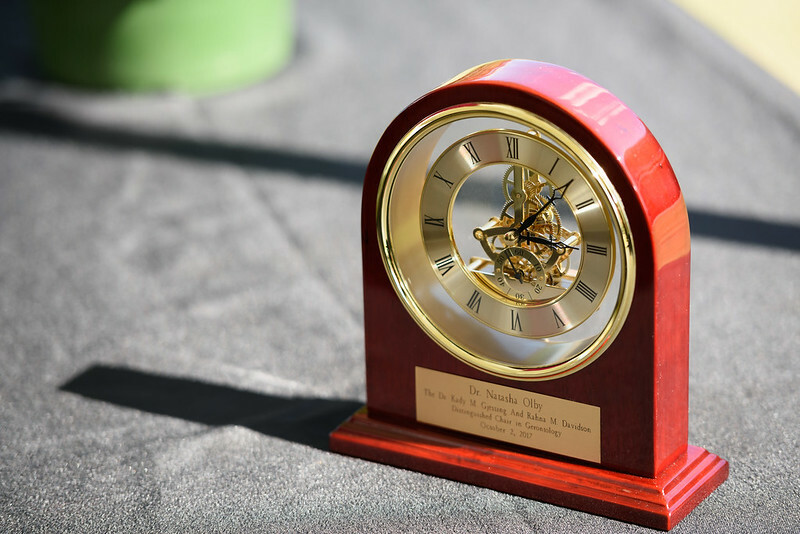 It’s a monumental gift for an ardently dedicated clinician-scientist. 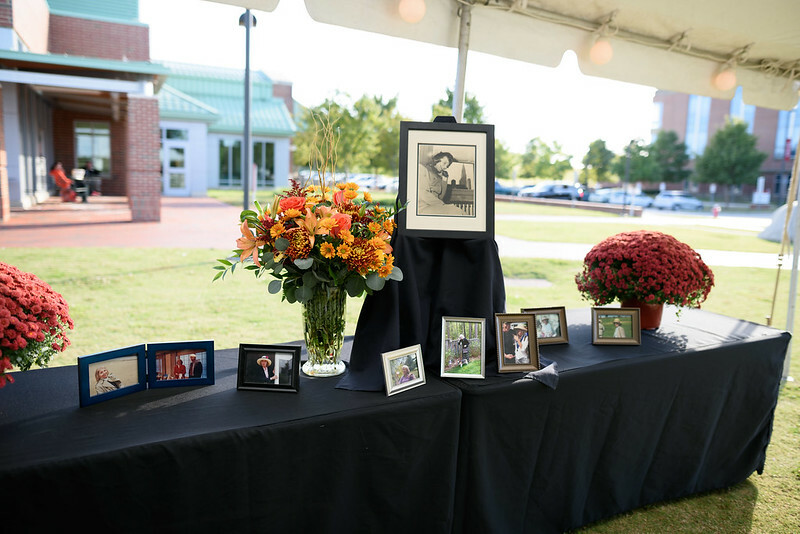 The gift comes from Gjessing, of the class of 1994 and a vet practicing in North Raleigh, in honor of her mom, Davidson, an animal lover who once served on the CVM’s North Carolina Veterinary Medical Foundation Board. 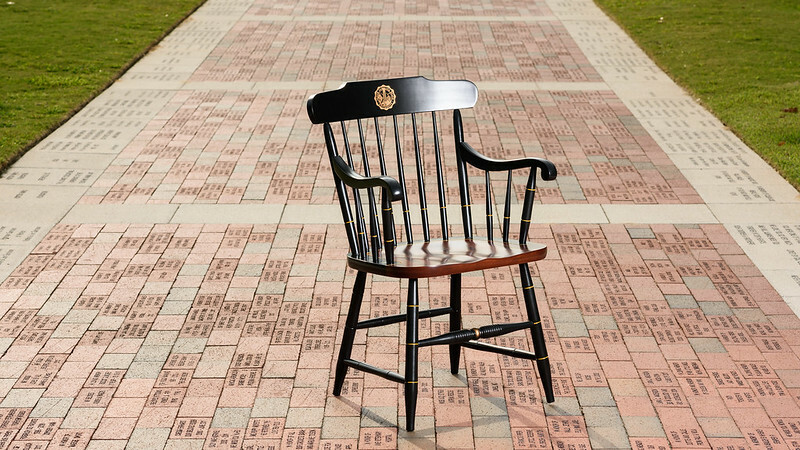 It is the largest donation to the CVM from an alumnus — nearly $3.7 million, with $1.5 million in cash and a $1.5 million match from the R.B. Terry Charitable Foundation. 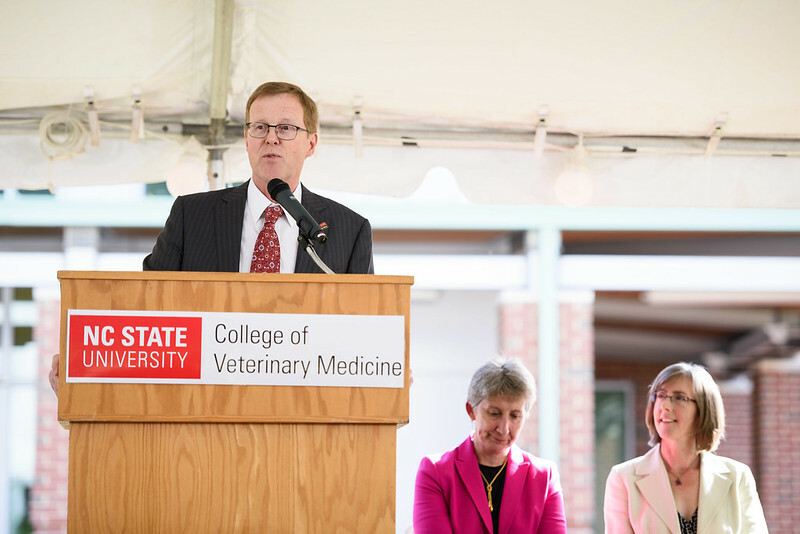 It is the largest endowed chair in NC State University history and lays the foundation for a veterinary gerontology program at the CVM, which will be the first of its kind at a veterinary college in the United States. 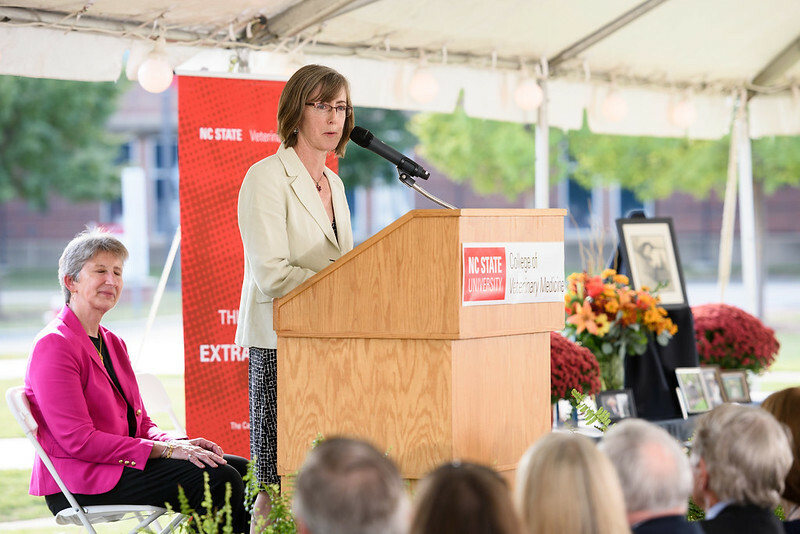 Such a program will likely focus on student teaching, care practices for aging patients and research benefitting both animals and humans. 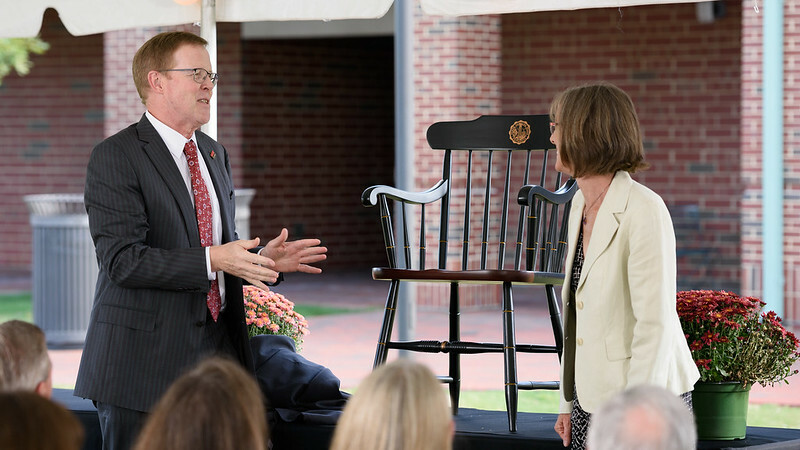 Olby, sharing the stage with Gjessing, was presented with the distinguished chair — and an actual chair emblazoned with a plaque marking the occasion — during a ceremony Monday afternoon on the CVM’s hearth, with an audience that included mentors-turned-colleagues and colleagues who quickly became friends during her two decades at the CVM. 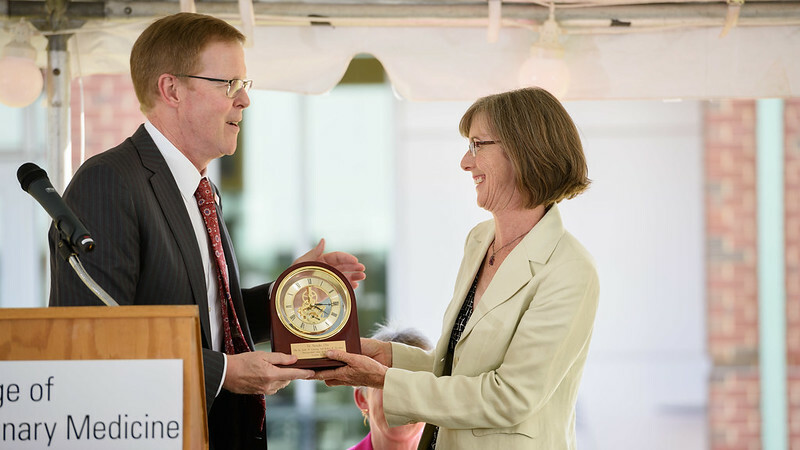 CVM Dean Paul Lunn first met Olby at Cambridge; when she was a veterinary student he was studying for his Ph.D.
“Natasha was the smartest person in a very, very smart class,” Lunn said. Lunn spoke of a personal friendship he quickly developed with Olby. 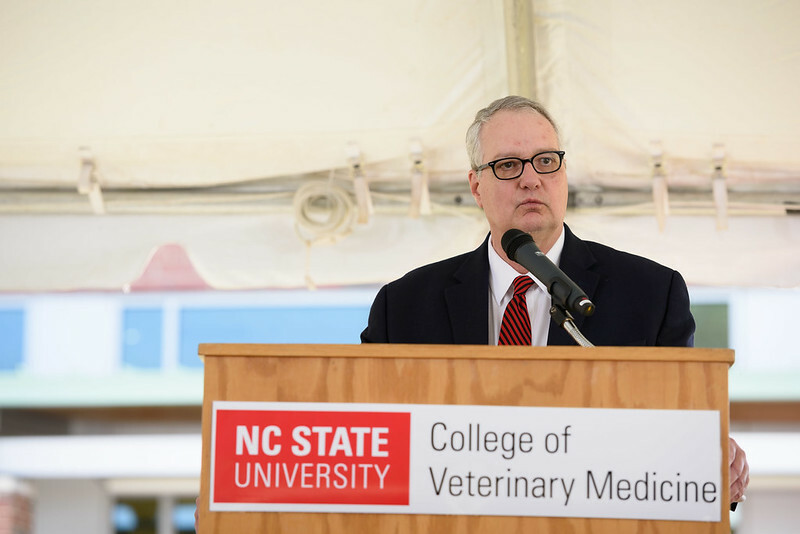 So did Warwick Arden, former CVM dean and now NC State’s executive vice chancellor and provost, who met Olby when he interviewed for the the dean position. 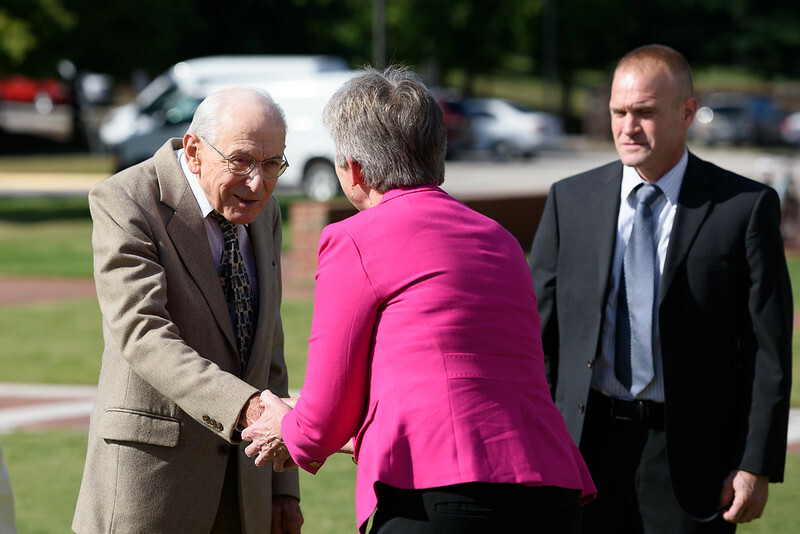 After spending some less formal time getting to know Olby and other CVM professors over coffee that day, Arden was convinced that the CVM was the place for him, incredibly impressed with Olby’s compassion and humanity. 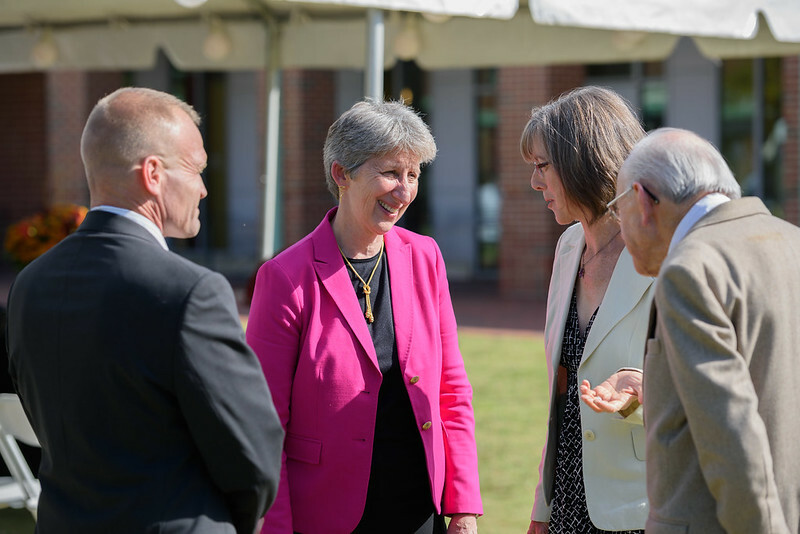 During the ceremony, Arden and Lunn both thanked Gjessing for her innovative vision of a gerontology program with tremendous translational appeal. Research projects may one day shed light on aging in humans as well. 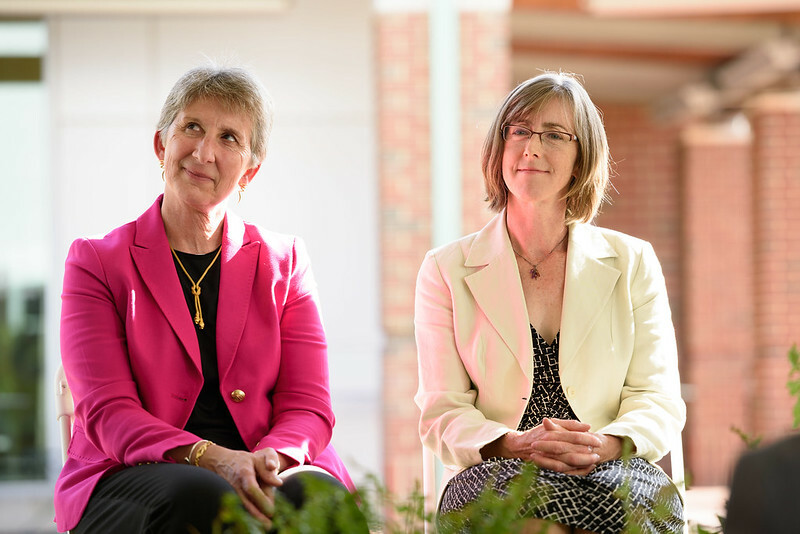 Gjessing said the endowed chair strongly reflects her mother’s strong interest in both older animals — she once had a dog named Charlie who had degenerative myelopathy — and neurology, Olby’s expertise. 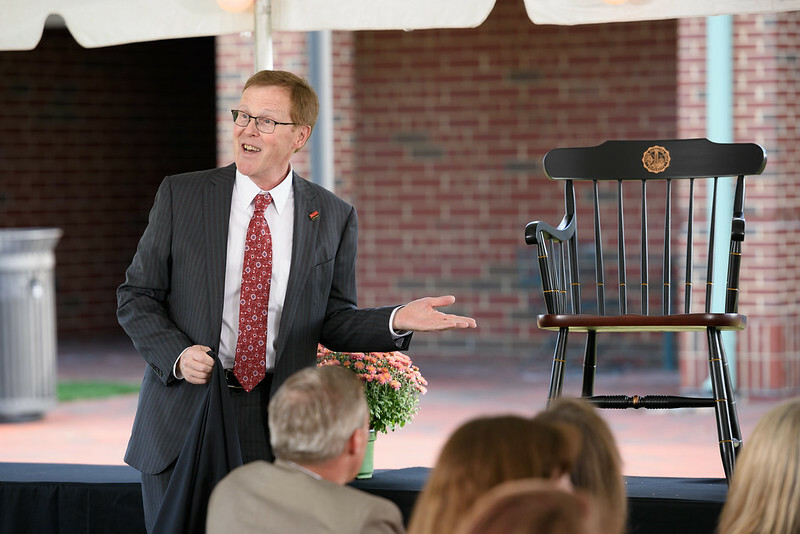 Gjessing described Olby as the ideal person to receive the chair. 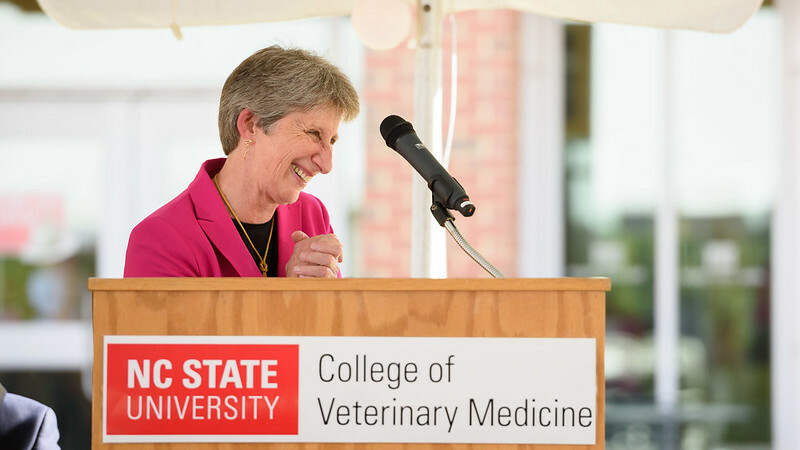 Though there is no board-certified veterinary specialty in gerontology, the needs of aging animals are consistently addressed at the CVM — in both the classroom and the specialties at the Veterinary Hospital. Health issues related to aging frequently factor in Olby’s work. 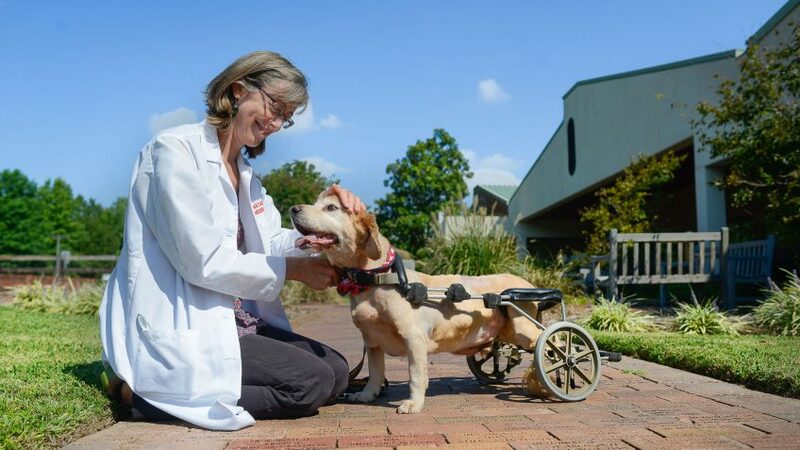 Her research program focuses on paralysis and loss of mobility in dogs. Within the field of genetics, Olby studies neurodegenerative diseases in animals to discover what they can tell us about the mechanisms of similar diseases in humans and to develop new treatments for these conditions. A week before the chair ceremony, Olby was in Finland attending a veterinary conference centered on the role genetics play in the neuroscience of aging. Olby developed a passion for neurology as she pursued her Ph.D. A native of Oxford, England, she received her bachelor’s in medical sciences and her veterinary degree from Cambridge University, she wanted to be a surgeon, and it was required that she earn a Ph.D. She looked for a research lab to join. One such lab ticked two big boxes. 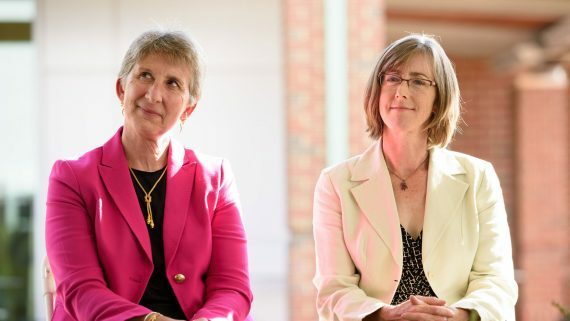 It offered Olby funding for her Ph.D. and residency via the biomedical research nonprofit Wellcome Fund, and the leader of the lab was the treasurer of a local boat club. Olby loved the sport of rowing, and at the time was mulling a tryout for the national team. Her Ph.D. and post-doctoral work focused on acute spinal cord injury. 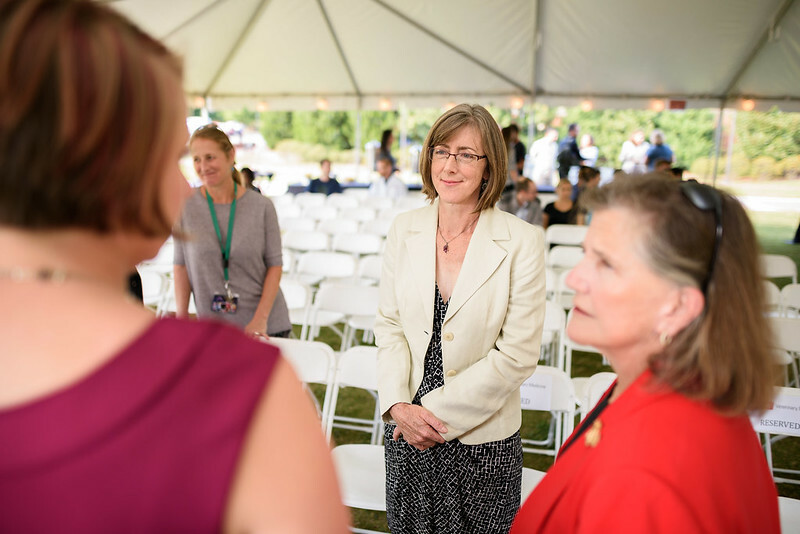 Then, after completing a three-year neurology residency at the CVM, Olby accepted a position as an assistant professor of neurology at the school. 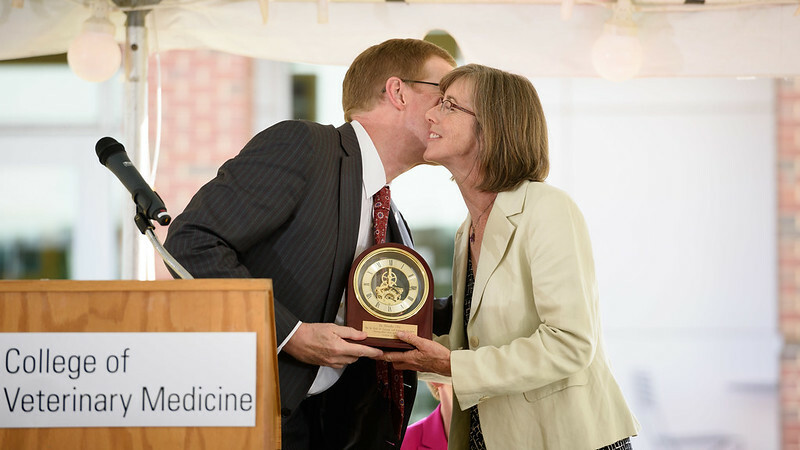 She progressed through the ranks and, in 2011, became a full professor. Olby has taught neurology in numerous courses on everything from veterinary neuropathology and advanced small animal surgery to feline medicine and veterinary pharmacology. 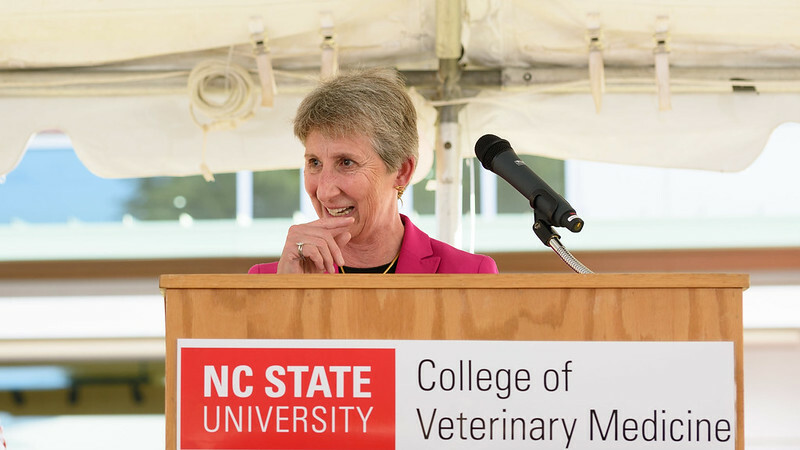 She has also mentored several Ph.D. and post-doctoral research students including Courtney Rousse Sparks, now in the middle of the CVM’s dual DVM/Ph.D. program. For her Ph.D., Sparks is studying Chiari-like malformations in Cavalier King Charles spaniels, a condition also seen in humans. 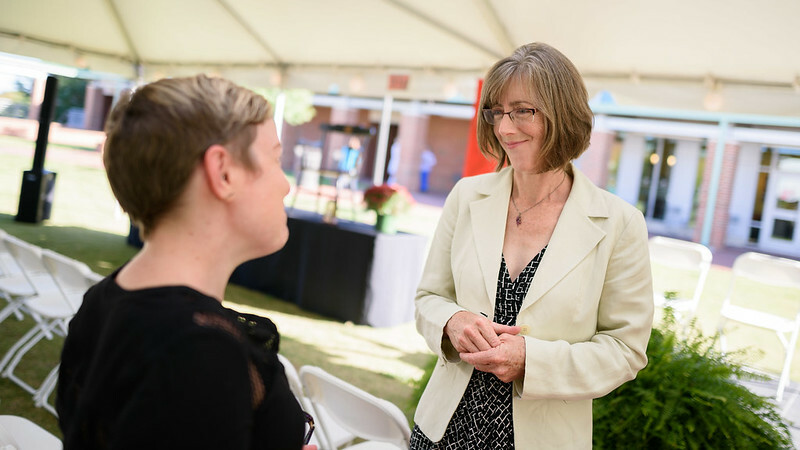 Olby’s biggest motivators remain an endless fascination with the nervous system and the translational applications of her research. Now, the chair will give Olby an opportunity to do even more of the work she’s so passionate about. 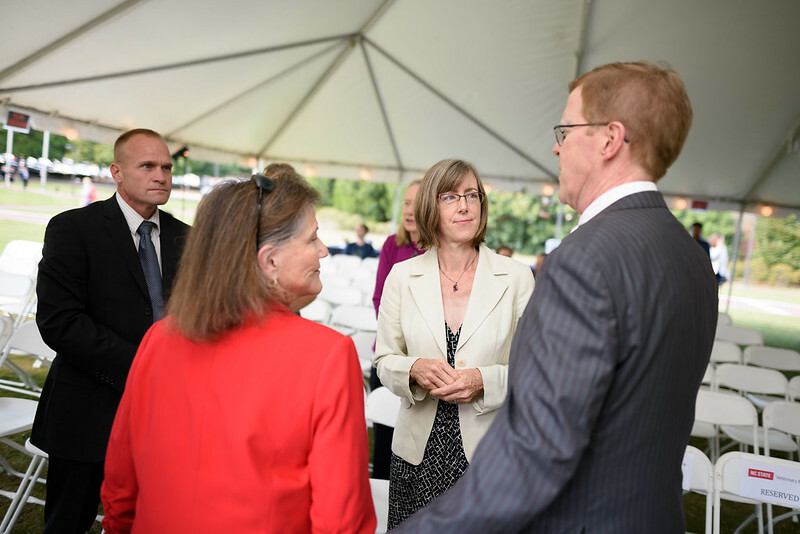 “What I’m excited about is the opportunity this will give me to expand my horizons and give me a really solid base for the research that I do,” she said. “I was incredibly lucky this appeared for me and is coming from someone who I identify with.